Here’s a snap shot of my forest friends Flam and Falun. They really are an autumn duo. My hedgehog is getting along fine too. I just tweeted a first glimpse of his face. I do have trouble finding a suitable name for him….it’s getting harder every time. 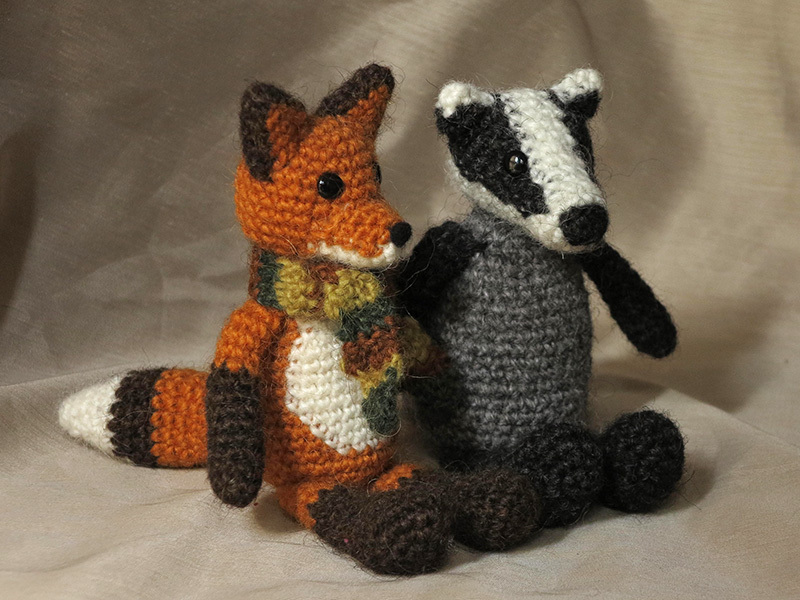 Here you can find the badger and fox patterns. Very playful, sturdy and cute. Meet my crochet fox amigurumi called Flam. When I first published this crochet fox pattern in 2014, I was just at the beginning of my career as crochet animal pattern designer. Back then, I didn’t know how things would go in the future and what I posted here at my blog did not look as professional as it does today. So that is why this post really needed to be updated, and so did the pattern. 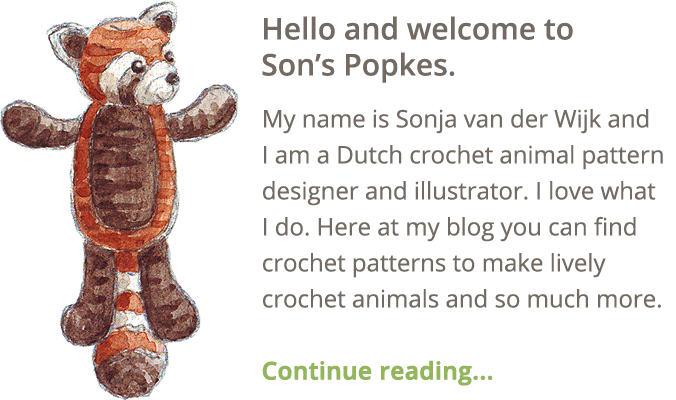 In the original post, I wrote about how pleased I was that the crochet fox doll resembled the sketch I made quite well. I always use a sketch as a guidance for the crochet version. Flam turned out to be such a playful doll and I love every bit of him. Flam himself hasn’t changed that much, how could I, he actually is my best selling pattern! However, I did change his body and white belly, so it would look much rounder and neater. What really needed an update were the pictures. Nowadays I add many images to a pattern. Some helpful images next to the instructions and much more at the bottom of the pattern of the completed animal from all angles. Flam’s pattern looks all shiny and new now. 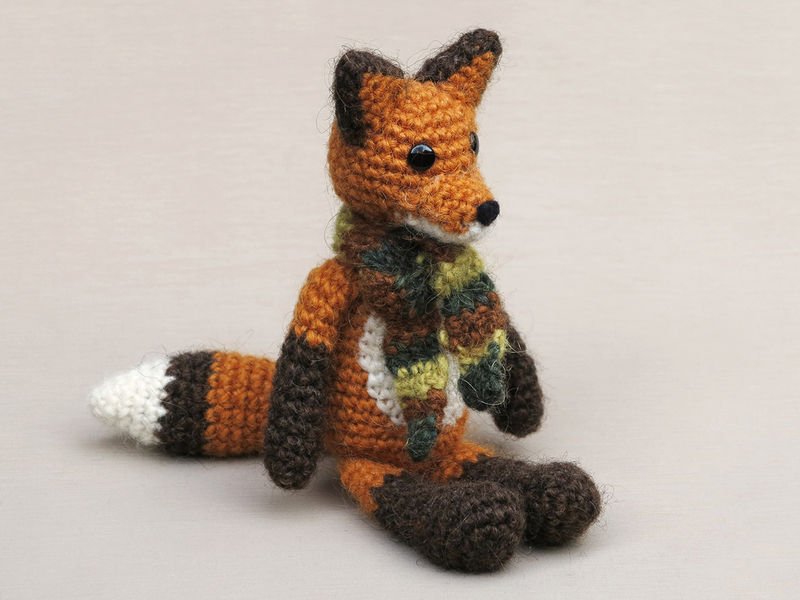 Just look at these new images of my crochet fox, I am so happy with the result. Below them you can find info about and links to buy the pattern. 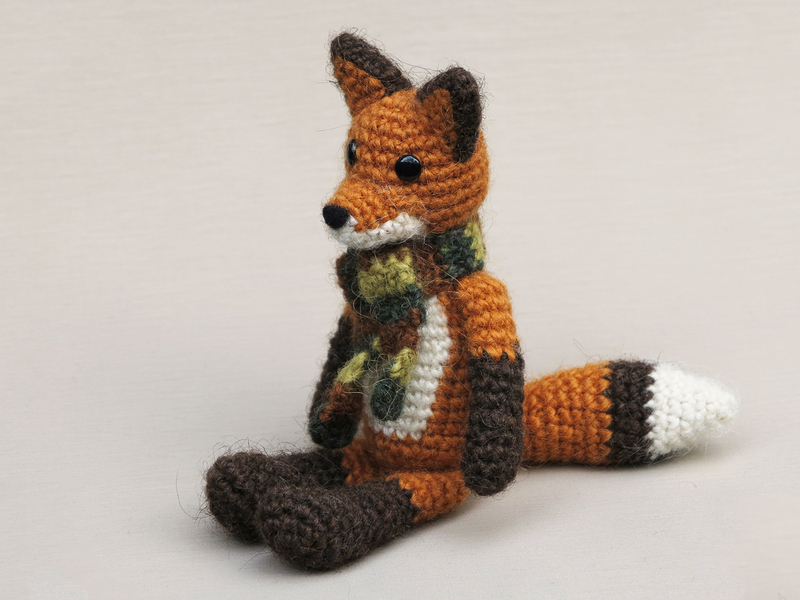 This crochet fox amigurumi is made with Istex Lett Lopi, a 100% wool. Flam is sitting 5.6 inch / 14.5 when made with worsted weight yarn. 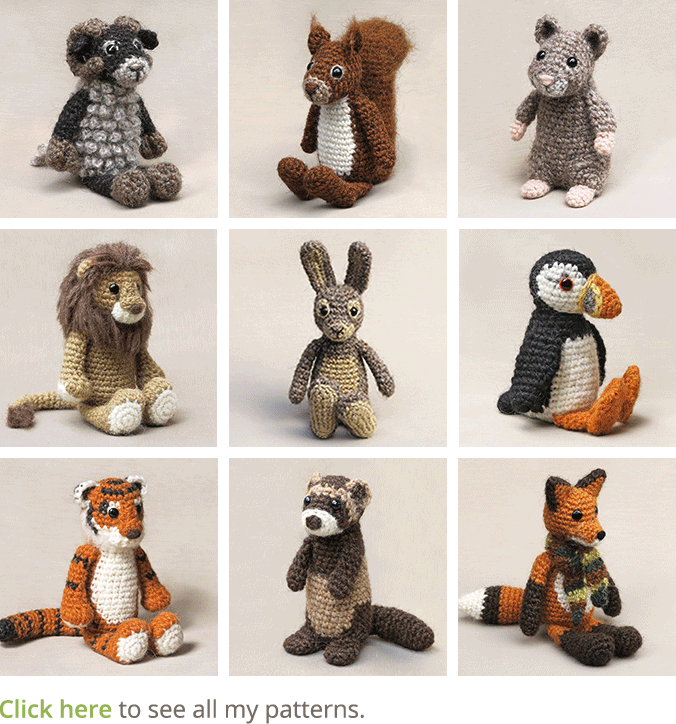 The pattern contains a clear and colour coded description of how to crochet and assemble this animal, with extra illustrations and example pictures at the bottom to help you get everything right. 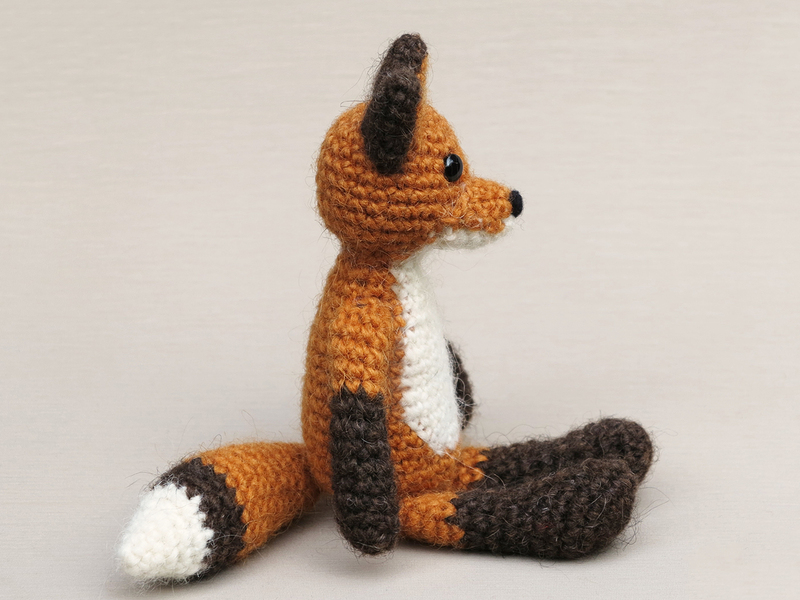 In the pattern you can also find what materials you need, the yarn colour numbers, in short, everything you need to know to make your own playful fox amigurumi. All the additional information you need to know about this pattern you can find in the shop listings. You can buy this pattern in my shop at Craftsy and in my shop at Ravelry or order it here. Meet Fox McCloud, the hero of the Starfox games. Tough but fuzzy, sturdy but soft. This was a tricky doll to crochet. I didn’t know where to start, so made the most fun part first, the boots, because if the boots where finished, the rest needed to come for sure. The boots turned out great and it worked! After the boots, I made the legs and body in one piece, after that the jacket, arms and tail. And then came the head, which I had to make 5 times. The first one was too big, the second too small, the third the wrong shape and so on, till the fifth was good enough. And here’s the result! I didn’t love him at first, but after a few days I’m starting to do! The proportions of this doll where the hardest part. 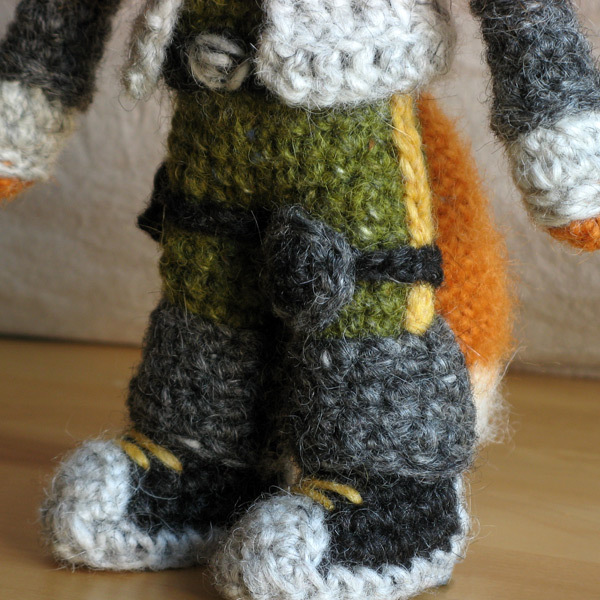 I knew which proportions this Starfox doll should have, but translating that into crochet stitches gave me a headache. Picking the right colour was a bit of a kerfuffle too. 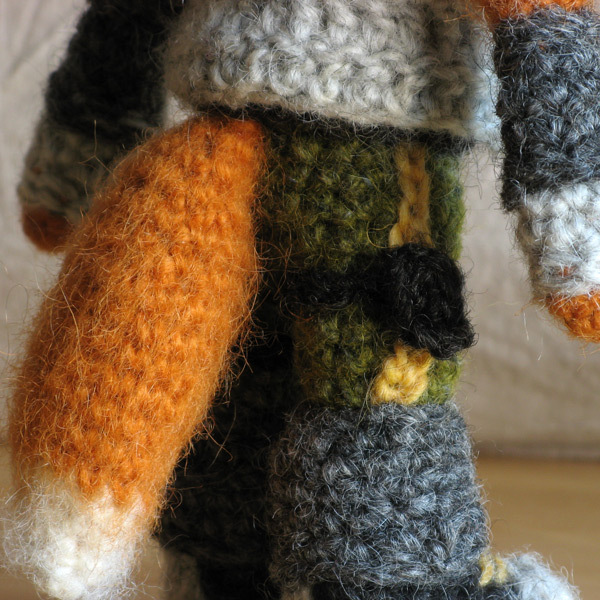 A long time ago I’d bought the yarn for Starfox, but when I started on the head, I began to doubt about the rusty fox colour I had. It was too dark, and the other orange I had, was too orange. So I went to a local shop, found a more yellow orange but that was a totally different kind of yarn. After some short circuit in my head, I decided to use the light orange. It turned out just fine, the little rage was for nothing. Here you can see detailed pictures of different parts of Starfox. In one of the images you can see how I made his expression. The real Starfox has white oval shaped eyes. I tried to make them, but I didn’t like my Fox with eyes like that. He just looked too mean and I couldn’t get it nice. I decided to leave out the white bits and just go for brads with green felt underneath and a little embroidered stripe above. This way he was lovable, but maybe a bit less Starfox. 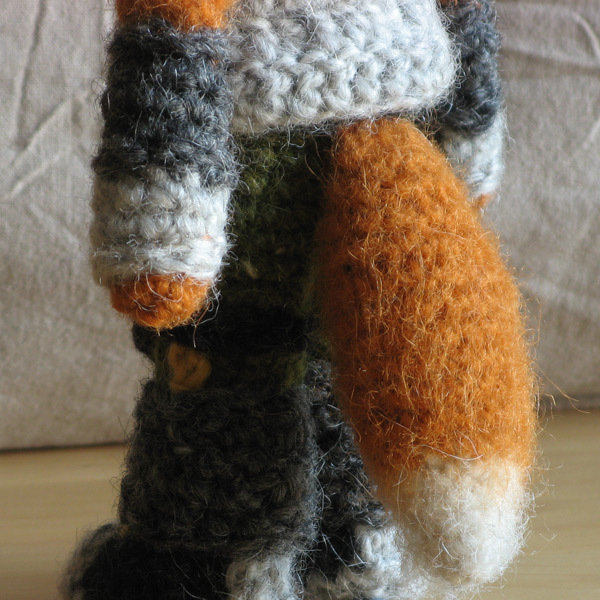 Crochet Starfox is about 20 cm / 8 inch tall, made with a worsted weight yarn. His fur coat is brushed a bit. 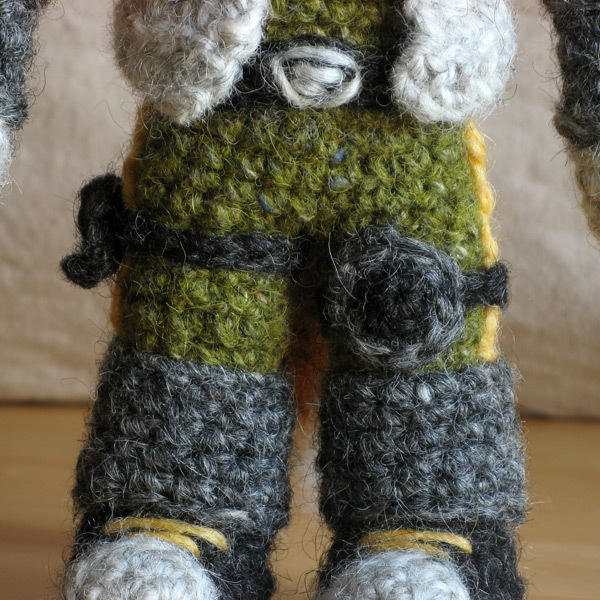 This is the last game figure I’m going to crochet. The reason is, I find it quite limiting to make an existing figure. It has to look like ‘the real thing’ which puts boundaries to my own fantasy. Making me own creations give me a lot more satisfaction and less frustration. The pattern for this doll you can buy for a small amount at Son’s Popkes Shop and in my Ravelry shop. You can also order it directly from me here. 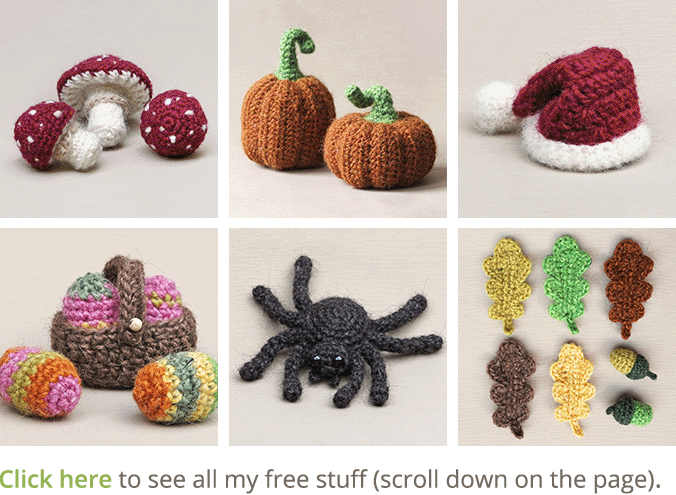 The pattern is written like the free patterns here, in standard American crochet terms. It contains clear instructions and lot’s of example images.